Volume consumption of tilapia in the U.S., the largest tilapia importer, witnessed confined growth prospects with decline an excess of 10 KT estimated in 2017 over 2016, as per Fact.MR study. Declined consumption patterns mimic the broader trends in the production scenario as low prices pose challenges for companies to maintain high profitability. On the contrary, the second largest consumer - Russian Federation witnessed an increase in demand with a marginal volume consumption of 4 KT in the period of 2016-2017. Report opines that the Russian Federation tilapia market is expected to report a steady demand for tilapia through 2022 while presenting emerging opportunities for Chinese suppliers in the future. Domestic consumption predominates the tilapia market where the loss in exports is countervailed by persistently rising demand in the domestic markets of producing countries. 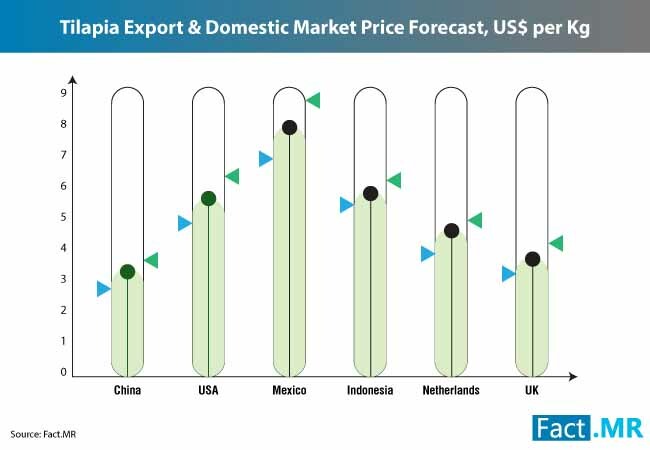 As the domestic consumption holds sway, Fact.MR clearly estimates the preeminence of domestic market prices over export prices in the profiled exporting countries during the forecast period. According to the study, Greater China, the largest producer of the tilapia will maintain its dominion with an estimated production of 1989 KT in 2017, about 28% of the global production. While China continues to helm the production, global tilapia trade has witnessed increasing participation of other tilapia producing countries. With the improvements in aquaculture practices, tilapia markets in Egypt and Indonesia are estimated to account for over 36% of the global production collectively while significantly curbing the share of the Chinese tilapia market. Erosion of the Chinese tilapia market can also be attributed to increasing inclination of tilapia farmers for other specialty fishes such as pangasius owing to increasing demand for this low-cost fish variety. Amidst the declining shares of China, Fact.MR study reveals a persistent increase in the global tilapia production wherein top ten countries (China, Egypt, Indonesia, Bangladesh, Philippines, Thailand, Vietnam, Brazil, Mexico and Uganda) are expected to account for 90% of the global production by the end of 2028. Considering the nature of the commodity, export market dominates the frozen varieties of tilapia. Fact.MR finds that demand for frozen tilapia in the U.S. accounted for over 86% of the total U.S. demand in 2017, of which frozen fillets were highly consumed as compared to frozen whole tilapia. Ubiquitous demand for tilapia in American restaurants and seafood aisles is one of the prime fillips continue to underpin the higher share of frozen tilapia in the U.S. by the end of 2028. However, tariffs on the Chinese seafood following the US-China trade war will continue to deter the growth prospects for Chinese exporters. Comparable trends in the demand for tilapia frozen fillets was estimated in the Russian Federation where over 98% of the total tilapia consumption is expected to be held by tilapia frozen fillets throughout the forecast period. Impacted by the changing prices in the tilapia market, prominent players in tier 1 and tier 2 have been observed to dip their toes into the new venture of introducing novel product offerings to target the high potential market including the U.S. and Eu28. Observing the growing preference for eco-labelling, convenience packaging and increasing emphasis on the low-antibiotic production process, prominent players have identified the increasing consumer pallet for premium products in the leading export market. Fact.MR foresees steady growth prospects for the tilapia market while considering important caveats of the seafood industry that are likely to influence the future supply-demand equation. Increasing demand for other fish varieties such as pangasius, growing concern regarding production loss owing to Tilapia Lake Virus (TiLV) infection and lower appetite for tilapia in the potential market like EU28 are few of the prime factors that are likely to challenge the future sustainability of the tilapia market.